The 14th century account rolls for the Manor of Steyning hint at the sort of feasting the townsfolk might have enjoyed. '3 bullocks consumed, as customarily, at the town, at Christmas' they say and, then, 'The customary 3 bullocks for the town at the feast of St. John the Baptist (24th June)'. The Manor may not actually have been being quite as generous as this sounds. The way the cost of these bullocks is recorded makes us suspect that they were the same three animals – which were allocated to the town in June, at 2s. 3d a head, and then fattened up for eating at Christmas. They must have provided a feast indeed for the poorest people in the community who rarely or never could afford meat. Also, many of the poor would not have had a garden to supplement their diet. It has been calculated that the rural poor existed on a diet where bread made up more than 50% of what they ate and, well into the 20th century, Steyning parish was distributing bread tokens at Christmas to its needy. Whether all the ‘Christmas’ bullocks were eaten then or preserved for later consumption is not known. 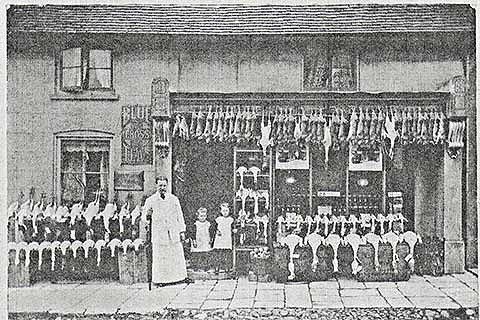 Meat was in short supply over the winter months, when there was no fresh grass to feed on, so animals were killed and pickled in salt. Several 17th and 18th century Steyning inventories recorded Salt Fish, Flitches of Bacon, Dried Beef and salt itself in the larder. For fresh meat during the winter months people fell back on rabbits, if they could avoid the game-keepers, and pigeons. In the roof space of No. 84 High Street there are still 64 pigeon squats. Perhaps the amount of salt in the diet accounted for some pretty heavy drinking in the past. Thomas Turner of East Hoathly, who visited Steyning in the mid 18th century, notably resolved to adopt a regime of sobriety. 'I will never drink more than four glasses of strong beer [of an evening] and never upon any terms and persuasions drink more than eight glasses of wine or punch' he wrote. To get an idea of how the wealthier strata of society lived we have only to look at the meal offered by Timothy Burrell of Cuckfield for his friends and neighbours during the festive season of 1707. There was beef, veal, a calf’s head and bacon, pig, a goose, capons, pullets and plumm pottage – before getting to the baked puddings, tarts and minced pies – all washed down with various wines. A recipe from that time for 'plumm pottage' says 'Take beef soup made of the legs of beef and add a couple of tongues to be boiled therein. Put fine bread, soaked and crumbled; raisins of the sun, currants and pruants [prunes? ], two lbs of each; lemons, nutmegs, mace and cloves to be boiled with it in a muslin bag. Add a quart of red wine and a pint of sack. Put it in a cool place and it will keep through Christmas'.